Southern Refrigerated Transport was founded in 1986. Since its establishment, it has served customers in 48 different states in the U.S. and in Canada by partnering with some of the best corporations, office staff and professional OTR drivers on the road. Southern Refrigerated Transport considers its clients and employees the heart of the company. This attitude can clearly be seen in everything that the company does: in its service, its equipment, and in its company policies. The people running Southern Refrigerated Transport are always looking towards the future, which can clearly be seen in the company headquarters located at Texarkana, Arkansas. The headquarters is a 100,000-square foot business complex that is able to support over 1,000 truck operations and is complete with a highly efficient maintenance shop that has more than 32 bays, a state of the art fuel island, a high tech bay dedicated for inspections, a free laundry facility, secured personal parking spaces, and an automatic eco-friendly truck wash.
With over 25 years of dependable carrier experience, SRT’s clients can enjoy peace of mind knowing that their cargo will arrive at their destinations safely and on time. SRT is able to develop programs that are surely exceed the clients’ transportation needs. Whether your cargo requires Temp Control, Dry Van, Canadian, or even Hazmats, SRT will create a transportation solution to deliver your goods. The company also offers 24/7 personalized customer service and web tracking so the clients can relax and see how their shipments are progressing. SRT also offers full EDI capabilities and comfort of knowing that the deliveries will get to their destinations on time. When it comes to focus on safety, SRT is unparalleled; and this focus has been recognized with several awards that validate their commitment to the public and its safety. If you are a solo or a team driver, then you can find everything that you’ll need with Southern Refrigerated Transport. The company has been known to offer excellent salaries, plenty of miles as well as extras such as bonuses, pet and rider policies, as well as an optional per diem. SRT caters to its drivers and make sure that they feel at home. Drivers can take full advantages of all the conveniences offered at the SRT headquarters such as showers, laundry rooms, free WI-FI, a TV lounge, vending and snack areas, and quiet and comfortable rooms that allow drivers coming from long deliveries to relax. Roadway Trucking is essentially for people and businesses who don’t have their own transport vehicles, which can take a large amount of merchandise to long distances. 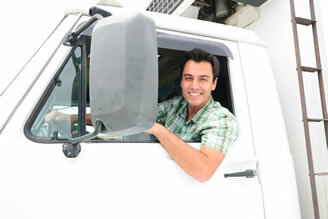 Hiring Roadway trucking is a good alternative for these people to get their delivery needs solved. For whatever reasons a person or business may have, choosing Roadway Trucking companies are much easier than to transport large quantities of things that you own, especially if you’re trying to move furniture such as couches or beds all across the country. The services offered by Roadway Trucking services has always been known to be reliable. The company always knows where the deliveries are, which makes them able to relay this information to their clients in order to give them piece of mind that their cargo will be delivered safely and on time. In case of any unforeseen circumstances which causes delay to the deliveries, roadway trucking companies are always ready and waiting to convey the information to the waiting customers. Customers can also track their own packages with the use of a computer with internet access and by providing the progressive rotating order (PRO) number of the cargo. • YRC Freight – it is one of the oldest roadway trucking companies, whose history can be tracked back to 1924. Being a fortune 500 company, it is one of the biggest trucking companies. YRC offers deliveries not only in the U.S. but to other countries such as Mexico, Canada, Guam, and Puerto Rico as well. • Old Dominion Trucking Company – Old Dominion is a union-free company that dates back to 1934. It is based in Thomasville, North Carolina and provides services all over the country. • Saia Trucking – The Saia Trucking Company was founded in 1924 and has grown to become a company that has over 8.000 employees are 15 terminals. It offers its services in the U.S., Mexico, Canada and Puerto Rico. • Conway Trucking – Since its founding, Conway trucking has managed to expand into 20 countries located in 5 different continents. The company is well known for its strict regulations on safety and requires its drivers to place first-rate safety to the cargo and themselves when delivering interstate. • Boat hauler – Just as the name clearly suggests, a roadway employee transport boats by using a special kind of trailer known as lowboy trailers. • Flatbed truck drivers – Flatbed truck drivers are the most common kind. These people carry large amounts of lumber, pipe, and tanks on trucks that have flatbeds. Dry van truck drivers are sometimes tasked with large trailers, which are called pneumatic trailer. These trucks were especially made to carry only sand or cement. • Tanker driver – This is another type of roadway trucking work, however, these jobs can be particularly dangerous most of the time. Tanker drivers are generally tasked with transporting a vast quality of chemicals, fuels, and other similar liquids. • Long haul driver – Long haul drivers are those who are tasked with carrying cargo across the U.S.
Over the years, Roadway trucking has become an influential part of the economy. Without the services it offers in the United States and to other countries, industries such as Wal-Mart, Subway, Tyson, and other similar companies would not be able to make the profit they are making now. The Saia LTL Frieght trucking comapny was started by Mr. Louis Saia, Sr. in 1924 using his own family car to deliver fresh produce. Today, the company is one of the largest trucking companies in the US with more than a thousand employees and with a billion dollars in revenue. It has undergone a lot of changes with the various changes of ownership that it has gone through but it has survived with the help of their company principles and their unique culture. The company specializes in less than truckload deliveries and was one of the biggest LTL companies in the US. Saia is part of Roadway Trucking Company. The Saia Trucking Company has made a lot of acquisitions in the past and it was these acquisitions which helped it to have the widest market coverage in the US. It entered into a merger with a Smalley Transportation which gave it access to south; joined with Jevic Transportation to form another company, the SCST; combines with the Clark Brothers Transportation, Inc. which led to its coverage of the Midwest; and today, they now have a total of 147 terminals that services 34 states in the US and Canada as well. They have also partnered with other trucking companies to address delivery services in Mexico and Puerto Rico. The company offers a wide array of services that specializes in less than truckload shipping. They offer single pup, set, and van services. Through the Saia LTL Freight you will be provided with a high quality and regional approach to deliveries. They cover more than 50,000 zip codes in 34 states and they offer more than 10,000 1- and 2-day lanes. More than 80% of the cargoes that are handled by the company are delivered in less than 2 days and they arrive on-time, 98% of the time. You can expect an efficient next-day delivery if your cargo will only require a distance of 600 miles. Saia also focuses on their social corporate responsibility to make sure that not only them, but the people who surround them also benefit from their gains. As a proof, the company has been certified by the American Chemistry Council with the Responsible Care Program which is a rigorous process that determines a company’s safe environmental practices in terms of pollution prevention, community awareness, and distribution systems. They have also been ISO certified as to quality management which just shows the high standards that they use in managing their resources and trucking services. Conway Trucking was named as the “Most Admired Company” in the field of logistics and transportation in 2007 which states just what kind of a trucking company they are. 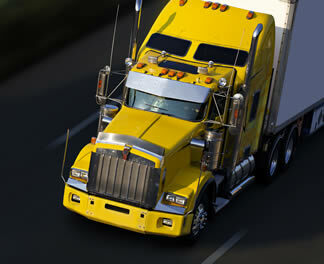 The company has several divisions which handle the various aspects of their trucking business. They are the Con-way Truckload, the Con-way Freight, and Menlo Worldwide Logistics. Through these divisions, the company offers local and international LTL, logistics and supply chain management, warehousing, and freight transportation across the United States and internationally. Today, Conway is available in five continents and in more than 400 locations across the US. Conway Trucking was first established in 1929 by Leland James in Portland, Oregon. It was initially named as Consolidates Truck Lines and was changed to Consolidated Freightways later on. 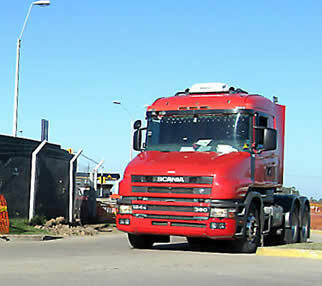 In 1983, it eventually changed to Con-way where the company offered regional short-haul trucking services to the public. It had the Conway Central Express, the Conway Easter Express, and the Conway Western Express. Further improvements occurred along the way with the founding of Menlo Logistics and the Con-way Truckload services. The latter handled the long haul and transcontinental services of the company. They were also able to expand to Asia by the year of 2007 which was based in Singapore. 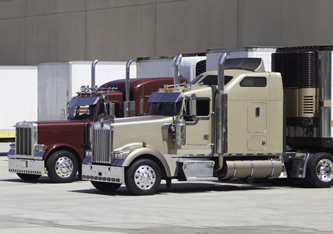 Today, the company provides several trucking services in the US and in its international market that includes local, regional, and transcontinental LTL services; logistics services through Menlo Logistics that provides transportation management, warehousing, and also offers supply chain solutions; lastly, they also offer full truckload services which they offer in the US, Canada, and in Mexico. The company operates on a total of 20 countries across the globe and they employ more than 28,000 personnel in their business making them one of the largest trucking businesses in the United States. Aside from their commercial services, Conway is also active in their corporate social responsibility. This company offers scholarship programs and support to families of their employees who serve in the military. They are also active participants in the federal government’s SmartWay program which seeks environment-friendly transportation solutions. They are also one of the leading businesses in the country that helps create employment for a lot of people. This they are able to achieve while still providing their shareholders with sufficient returns for their investments. As a result, they are able to enrich a lot of lives through their company and have been an important entity for many. Today, Conway trucking is the leader in the field of trucking services with their combined expertise and large capital which amounts to more than $5 billion. They operate through several divisions – the Conway Freight which provides regional, inter-regional, and national LTL services; the Conway Truckload which provides high quality flatbed and dry van truckload services; and Menlo Worldwide Logistics that provides transportation management and logistics services across the globe. Employing more than 20,000 personnel and the latest in technology and environment-friendly approaches to trucking services, it is no wonder that this company had become the leading company in the industry. 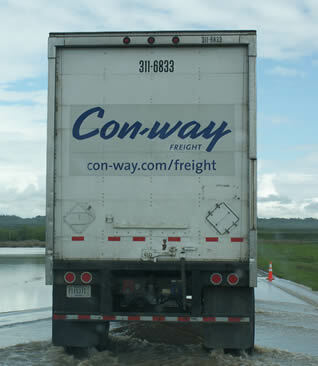 The Conway brand is part of the Roadway trucking company. Founded in 1981, Navaho Express is a family owned and operated business by Don Digby Sr. and his family. It has been one of the leading transporters of both dry goods and perishable commodities in 48 different states. For more than 75 years in the trucking industry, the company has continued its track record of being committed to their drivers, as they are a driver focused company who understands the challenges that drivers face each and every day. By providing their drivers the best experiences there are, Navajo Express has been able to provide safe, fast, and reliable trucking solutions, giving their clients piece of mind knowing that their cargo will reach their destinations in good conditions and in a timely manner. What started out as a small trucking company has now become a company that operates over 1,000 trucks with more than 2,000 trailers that are running Over the Road, regional, and dedicated operations all over the nation. Their Regional fleets cover Texas, New Mexico, Arizona, Colorado, Wyoming, Nevada, Idaho, Washington, Oregon, and California. Regional drivers are guaranteed to be home every 2 weeks. Although the company’s major service is OTC carrier, regional and dedicated services are also available. Working for Navajo Express not only means competitive salaries, but also great benefits, such as Medical; Dental; Vision; Life Insurance; and Paid Vacations. Another great benefit in joining the Navajo trucking family is that the equipment. The company also offers the latest news within the industry, as well as highway safety tips for both new and old drivers. Navajo Express makes certain that all their trucks are still considered new. Their eldest trucks are only 3 years old and they are currently rolling out brand new 2014 Freightliners and Kenworths.